You’ve heard that breakfast is the most important meal of the day and now a new publication by the American Heart Association shows that skipping breakfast could increase the change of a heart attack in men by up to 27%. Men who reported they skipped breakfast had a 27 percent higher risk of heart attack or death from coronary heart disease than those who reported they didnâ€™t. The men who reported not eating breakfast were younger than those who did, and were more likely to be smokers, employed full time, unmarried, less physically active and drank more alcohol. Men who reported eating late at night (eating after going to bed) had a 55 percent higher coronary heart disease risk than those who didnâ€™t. But researchers were less convinced this was a major public health concern because few men in the study reported this behavior. During the study, 1,572 of the men had first-time cardiac events. 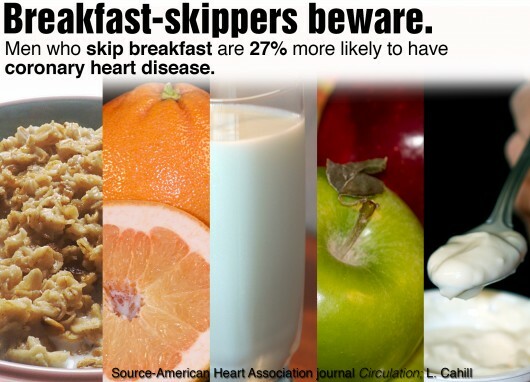 â€œSkipping breakfast may lead to one or more risk factors, including obesity, high blood pressure, high cholesterol and diabetes, which may in turn lead to a heart attack over time,â€ said Leah E. Cahill, Ph.D., study lead author and Postdoctoral Research Fellow in the Department of Nutrition at Harvard School of Public Health in Boston, Mass. â€œOur study group has spent decades studying the health effects of diet quality and composition, and now this new data also suggests overall dietary habits can be important to lower risk of coronary heart disease,â€ said Eric Rimm, Sc.D., senior author and Associate Professor of Epidemiology and Nutrition, Harvard School of Public Health and Associate Professor of Medicine at the Harvard Medical School. Men who reported eating breakfast ate on average one more time per day than those who skipped breakfast, implying that those who abstained from breakfast were not eating additional make-up meals later in the day. Although there was some overlap between those who skipped breakfast and those who ate late at night, 76 percent of late-night eaters also ate breakfast, researchers said. 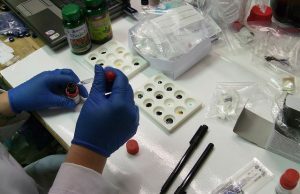 The study collected comprehensive questionnaire data from the participants and accounted for many important factors such as TV watching, physical activity, sleep, diet quality, alcohol intake, medical history, BMI, and social factors like whether or not the men worked full-time, were married, saw their doctor regularly for physical exams, or smoked currently or in the past. While the current study group was composed of men who were of 97 percent white European descent, the results should also apply to women and other ethnic groups, but this should be tested in additional studies, researchers said.